Our 2007 August vacation in Newfoundland included a three-day stay in a little outport fishing village called Elliston. Inland roads now link together many of these old isolated outport villages. 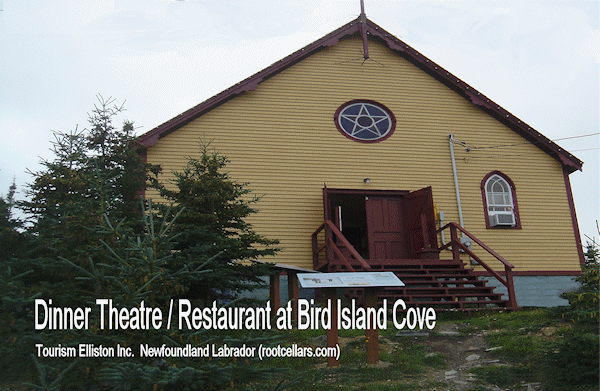 Its original name was "Bird Island Cove" but, unfortunately, in the early 1900's, it was renamed to honour their local minister. This renaming was appropriate at the time but times change. It is not so appropriate a name if you are trying to attract tourists to see the local puffins and large icebergs drifting past the picturesque coastline in early spring. A small rugged island within a stone,s throw of a steep cliff edge becomes home for puffin nesting season. You can see this small rugged island in the photo below. We only had a small camera so I added a small photo of a wood puffin as an illustration. That little blue dot at the edge of the cliff is my wife taking pictures of puffins with our small digital camera. Unfortunately, we did not bring our telephoto camera with us. It was just too heavy but we recently replaced it with a light weight digital telephoto camera. We have designed most of the photos that follow below into official- looking postcards as examples of promotional material that could be used by the local Tourist Commission if they so desired. This was part of my promise to the mayor and will be discussed below under "Our Visitors Comments". 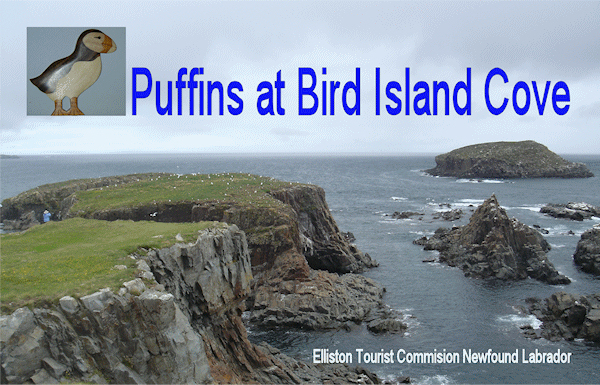 The digital files used to construct these official-looking postcards seen below are available upon request to the local Elliston Tourist Commission free of charge. The Puffin viewing area is within easy, picturesque, walking distance from the road. But be careful as you walk the narrow path as this is a rugged landscape. We have included below another view of the picturesque coastline of Bird Island Cove. Our small pocket-sized digital camera works well for general landscapes thus providing some interesting memories. In the distance on the other side of this scenic formation, the village has developed a public beach with modern facilities as part of their visitor infrastructure. But the marketing plan for the greater region as a whole appears fragmented, lacking an integrated structure that would include all villages and sites in the area. While looking at the scenic coastline above, let's for a moment imagine a lonely outport village with no easy access to modern grocery stores. They warded off winter hunger and scurvy by storing root vegetable in a system of rootcellars that kept them at a preservable temperature. We find it impossible to focus our modern minds on such hardship. It was a culture of isolation from other cultures, work, family, friends and religious leaders formed a social group. For example, cultures have, for centuries, struggled to explain to children where babies came from. 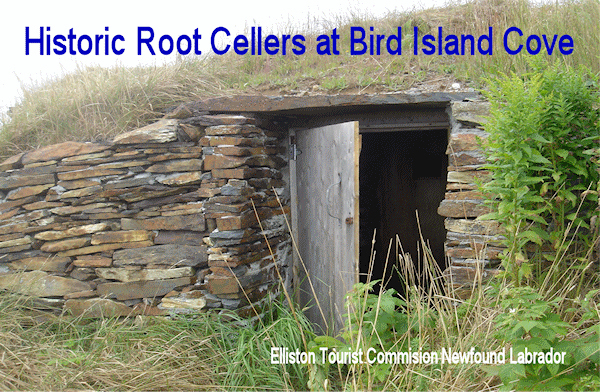 The people of Bird Island Cove had no mythical stork to call upon so they used their root cellar as a means of explaining to children the source of babies. Children with active imaginations would listen quietly at the root cellar door and claim to hear baby noises from deep within. We walked around the village photographing a number of root cellars. A photograph of one is included below. Eventually, it was time to eat so we made our way to the old Village Hall turned restaurant. The food was excellent, plentiful and very reasonably priced. Many of the local villagers eat in the old Hall turned restaurant. We enjoyed overhearing stories of the good times they had in that building. The proprietors - a very energetic husband and wife team - are planning a dinner theatre. It was their first year of restaurant operation. They also run the bed and breakfast at which we stayed. The village desperately needs energetic people willing to face the difficulties of developing a tourist infrastructure. The following graphic shows the location of our Bed and Breakfast within the village context. The villagers that we encountered during our morning and evening walks were very friendly. Most dwellings except a few abandoned buildings were simple but clean and well- maintained. We used the village as a home-base from which we could explore the surrounding coastal attractions. In the late 90s, the villagers found themselves unable to pay for the hydro to power their street lights and, when darkness descended, the village found itself fragmented into little spots of light glowing in the darkness then descended into deeper darkness as each little light was turned off for the night . The village is slowly recovering from what they refer to as the "dark times". During one of my morning walks, I met and talked with the mayor. He mentioned that he and his council were requesting the village name be changed back to "Bird Island Cove" which is more descriptive of their primary tourist resource. I mentioned to the mayor that I would send my trip comments and photos that, in my opinion, would be interesting. And as it is a small village trying to develop an economy, he could use any material that I sent as he wished at no charge. Everyone we have spoken with finds the name Bird Island Cove attractive and brings to mind picturesque images as opposed to its current name 'Elliston' which does nothing for the adventurous imagination. 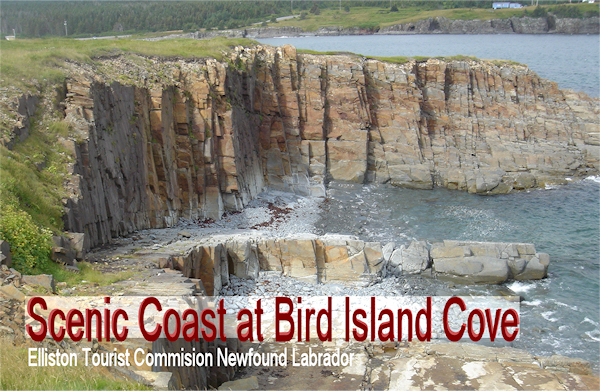 Yes based on name alone those we have spoken with would consider putting Bird Island Cove on their places to go list. Every one we spoke with could find nothing imaginative or attractive about the title 'Root Cellars. or 'Root Cellar Capital of the World'. Root cellars could be a secondary tourist draw that becomes active after tourists arrive. As a secondary draw, it requires onsite education to engage the tourist and may keep some tourists in the village longer than they would have if they had just come to see Puffins. The planned tourist centre currently under construction could be used to provide the onsite education. It may be an advantage to conduct simple tourist surveys to improve target marketing. When I say "simple" I mean simple and quick to complete . The ideal approach would be to have a service clerk covertly and randomly incorporate simple survey questions into normal conversation during a transaction. I personally dislike answering survey interrogatives . I even dislike being asked "is the food ok" especially when my mouth is full or I am in the middle of a sentence. You can ask every fifth or tenth customer over a period of time and the survey would be valid. Currently the village appears to market "Root Cellars" as a primary tourist attraction. 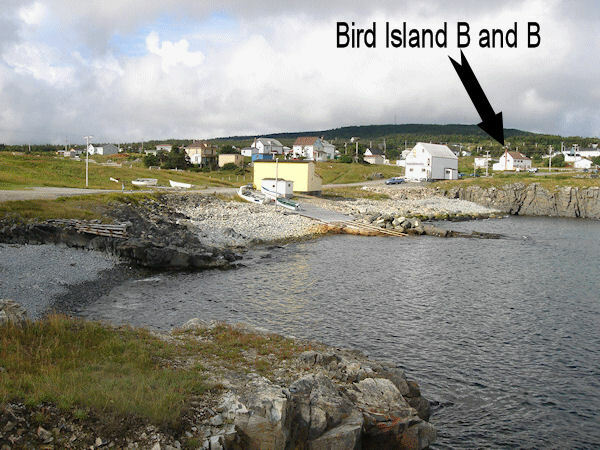 Our best advice to the village is to market the concept of "Bird Island" in a variety of ways eg: "Bird Island Cove Puffins" , "Puffins of Bird Island Cove" , "Where the Puffins Nest", and use root cellars. as a secondary tourist attraction. There are more bird watchers than Root Cellar watchers. It is unfortunate that this little village can't attract it's fair share of tourist revenue because its marketing does not hit the target. In terms of the region, Bird Island would act as one of many regional secondary draws to keep tourists in the area. Not only does the village lose, the region and the province as a whole lose because even an additional half day in the village is one more half day in the region and is one more half day in the Province. Everyone wins when tourists spend more time in Bird Island Cove. Tourist sites must be built and maintained. There are photographic scenic sites in Newfoundland and Nova Scotia ( also on our eastern trip) which have been allowed to become obscured with vegetation growth. All that is left is the name of the site. The site itself remains hidden from the tourist camera. If tourism is to be an economic generator, then you must make certain that its attractive features are visible; otherwise people will not find it worth their while to visit. An example that stands out in my mind is Mahone Bay in NS. Thirty to forty years ago, the picturesque churches were visible from the other side of the bay. Mature trees now obscure the classic view. 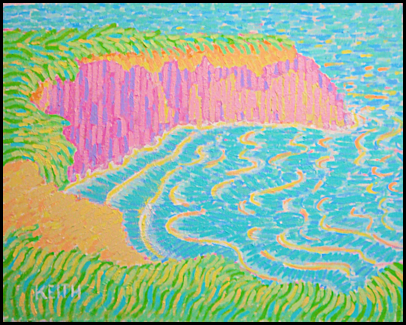 One of my objectives was to photograph the scene and paint it upon return home. I photographed each church up close and will reassemble them in a painting to give me the classic view. In Bird Island Cove, there are some old fishing boats and paraphernalia scattered around the town. These could be staged into picturesque scenes and promoted for photographers and general tourist photos. Possibly some design students or theatrical-staging students from the university could be engaged in such a project.